Because I frequently serve groups that include both spicy-food lovers and the heat-averse, I don't put chiles in my pad Thai. Instead, I give diners a choice of crushed red chiles or prik nam pla (fish sauce with sliced fresh Thai chiles) for applying at the table. Soak the noodles while you're prepping the other ingredients. This recipe was adapted from the July 2002 issue of Cook's Illustrated. In a large nonstick skillet, heat ½ tablespoon peanut oil over medium-high heat. Add the protein and brown quickly, sprinkling with salt to taste and cooking until nearly but not entirely cooked through. Transfer to a bowl and set aside. Add the remaining ½ tablespoon peanut oil to the pan. Add the shallot and stir until fragrant, about 10 seconds. Add the egg and scramble vigorously, sprinkling with a pinch of salt. Add the noodles, salted radish, 2 tablespoons peanuts, and 2 ounces bean sprouts. (No need to measure; just toss in most of the peanuts and bean sprouts.) 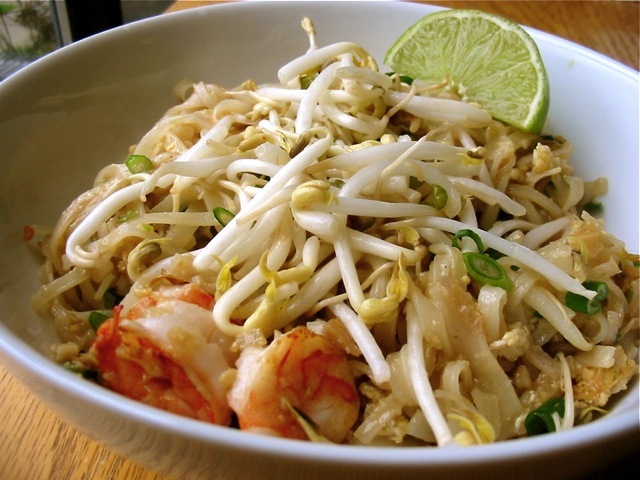 Toss briefly to combine ingredients and add the pad Thai sauce and partially cooked protein. Cook, tossing noodles with two wooden spoons, until sauce is nearly all absorbed and noodles are tender, about 2 minutes. Serve immediately, garnishing with the remaining peanuts, bean sprouts, and scallions. Pass the lime wedges at the table. Salted radish is also known variously as salted turnip, preserved radish, and pre-salted rad-turnip (not really). Available in Asian groceries, salted radish is sold in plastic bags and can be found chopped or in strips. It looks like beige leather — not terribly appetizing, but it provides an irreplaceable salty crunch to pad Thai. Note that this is not the same as "salted preserved vegetable" (which is cabbage or mustard greens) or the Japanese pickled daikon known as takuan. Read more in Matthew Amster-Burton's column about the art of making pad Thai.